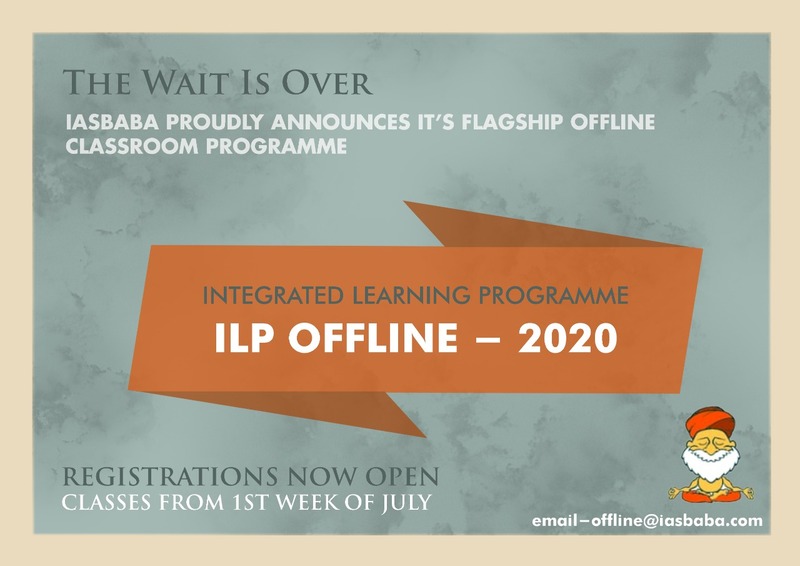 We are happy to announce the commencement of admissions for IASbaba’s Offline Classroom Programme 2020– the Integrated Learning Programme (ILP) Offline for CSE 2020. ILP (Offline) is a comprehensive classroom programme designed to meet all your preparation needs starting from prelims, through mains till interview in an integrated manner! In a first 6 OFFLINE (ILP , C2C) students including our first offline student – SUTHAR RAJ RAMESHCHANDRA (he was the first student to register). Working as a full-time scientist at ISRO and clearing UPSC is no small feat. He was our offline weekend batch student. Yes, if we are doing a classroom programme, then we would want it to be the best! Most structured and at the same time the one which can bring any ordinary person to UPSC standards in the shortest time. This was the motto with which we started our classes 3 years back. And you can see where IASbaba is today! Every Online and Offline programme of IASBaba is meticulously designed to suit the requirements of UPSC. Why is the 60 Day Programme so famous and most trusted? The answer is its QUALITY and its relevance to UPSC Questions and standard. Integrated Learning Programme (ILP) ONLINE– Today it is the number 1 Online Programme that provides the best guidance for not only Prelims but Mains as well. Quality and affordability are it’s USP. Our Classroom programme, which is the best programme in terms of quality and the largest offline programme in Bangalore is known for imparting individual attention to students. This is the most structured offline classes- starting from classes on day 1 to answer writing in month 3. ILP Program which has now become the biggest online environment for UPSC learning. 200+ selections in the span of just three years (2016, 2017, 2018) including Ranks 4, 5, 6 and 9 in TOP 10. 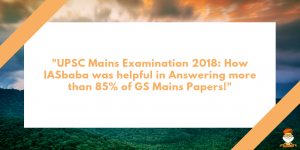 Our Hit Ratio in Mains and Prelims- 2017, which is close to 85 % and 70% respectively – How IASbaba was helpful in Mains 2017 and 68+in UPSC Civil Services Prelims 2017-How IASbaba Helped One to Get MAINS Call! What makes ILP (Offline) so special? Well! The answer to this question are many. But before we answer that question, let us tell you something about the values we believe in. Quality of guidance, sincerity in efforts and innovation in pedagogy are our core values. We strive hard to integrate these values in our packet of offerings to the student community, something that is clearly visible in our initiatives like ILP, AIPTS, C2C, TLP, DNA and so on. As a result of the success of these flagship initiatives, we started getting requests from many aspirants to move into the offline domain with similar quality, sincerity and innovation. In our effort to meet these demands, we came up with the offline classroom programme. The last three years of this programme have attracted students from different parts of the country (from 22 States) and the number of enrolments have been increasing year by year. This program is meant for those who have completed 0% of syllabus yet determined to succeed in the first attempt itself. Our flagship program ILP OFFLINE is designed to help freshers learn from first principles and build strong basics. This approach helped our students solve several confusing/ambiguous questions of Prelims 2017, 2018. We believe in smart work. Our classes and materials guide aspirants to get the best results with minimal time and effort. Regarding the quality and importance of the ILP- OFFLINE CLASSROOM 2019 programme, you can hear it from the students themselves. Integration of Online Programme with Offline Classes – Offline Classes will be complemented by ILP online program which would contain Babapedia (Current Affairs), Value Added Notes (VAN), Test Series. Duration of the programme will be 15 months. The classes will be conducted keeping all the 3 Stages of the examination (Prelims, Mains, Interview) in mind. All GS papers will be covered before Prelims. Prelims (GS + CSAT) and Mains Tests are incorporated in the programme. The tests will be designed keeping a fresher’s preparation in mind. Accordingly, there will be a gradual increase in the difficulty level of the test. In tune with the demand of UPSC, there will be weekly Current Affairs Classes/Discussions and Test. We have the best mentors for the programme who will guide you throughout with the best possible support. High Calibre Faculty: IAS rank holders, IIT, IIM and RV College alumni who are extremely talented, experienced, dynamic, friendly and accessible who will be providing vastly superior inputs. Unique Pedagogy: End to end integrated preparation with tests, discussions and quizzes modelled in the programme. Module wise completion of syllabus: Highly focussed and minute module planning with an aim to prepare your syllabus in an integrated manner by the end of January 2020. Weekday and weekend batches: Freshers, experienced candidates and working professionals alike can take advantage from the options of weekend and weekend batches. Online support: IASbaba is the only institute to sync offline and online programmes in the most systematic manner. Series of Interactive Lectures: Eminent personalities from various fields and previous year toppers invited to take value add sessions on important issues to enrich your preparation. Extracurricular activities: Throughout the year to make the classroom a vibrant and energetic place. We do not have “X” criterion of the syllabus that needs to be completed and ‘X’ books to be read to join our programme. An aspirant with Basic English and Aptitude is all we are looking forward to. A FRESHER who has the passion, zeal and perseverance to clear the exam in his/her 1st attempt, one who is honest and dedicated to put in that extra effort can join our Offline Programme. There are many students who are in their final year of graduation who joined the weekend batch and are ready to ace. We believe in the practical transformation of an individual who has no skill and want to assist/impart the required skill in the process. If any queries, you can visit our office/call on given numbers and also fill the registration form and wait for our call. How our Offline Classes differs from others? The first few classes will enable you with the proper understanding of Prelims and Mains. We are not selective in the selection of students to boast about the results later. Rather, we want to be part of the real transformation of a person from ‘Nil-UPSC’ to ‘Nail-UPSC’. The cohort group of students encompass a variety of backgrounds and experience to share with. Few of them are experienced/veterans, have joined the programme keeping aside their ego and ready to learn with a fresher as a fresher to get their basics right. ILP 2020 will be integrated with Offline classes. Subjects will be covered through short modules followed by regular tests in the end. This will provide double exercise and benefit to offline students, one through conceptual learning in class and the other through the online setup. There will be regular tests for Prelims and Mains both as per the plan. You will understand the importance and meaning of smart work. Write UPSC level answers in a mere 3 months into the course. In short, you will come to know, on what it takes to be in the coveted list of successful candidates! There is no wishful thinking or claims of ranks in future. We believe that the right work in the right direction will definitely be rewarded. This year’s (2018) result, stands testimony with over 82+ Ranks. We welcome you to come to Bengaluru, talk to our students about the classes and get their feedback before joining. You can also visit different institutes, compare the programs offered, material provided and make an informed choice. With each passing year, we are improving and innovating to meet or rather surpass the expectations of UPSC. We are committed to the extent that we are ready to put in double your efforts to make you succeed in the civil services examination. The classes shall start in the first week of July only at our Bengaluru centre. You can also reach us on offline@iasbaba.com and 9035077800/7353177800. So what are you waiting for? Come and take the big step with the institution that redefined IAS preparation!